At CES this year AMD spent a lot time talking up how it was going to attack the tablet market with its Z-60 APU and its next-generation Temash SoC. With Temash slated to launch by the end of this quarter the window of time during which the existence of Z-60 based tablets would make sense is closing rapidly. Despite this reality AMD’s first generation tablet APU has made a very tepid advance into the market. Vizio’s 11.6” AMD based tablet PC was easily one of the best Windows 8 tablet designs when it was announced. It had a stunning Full HD screen, a sleek look, and AMD’s Z-60 APU on the inside. It even received IGN’s best of CES 2013 award. At the time AMD was offering samples to interested press and many were looking forward to it. But here we are five months later without anything to show for all of the awards, high-end specifications, and interest on the part of the press. 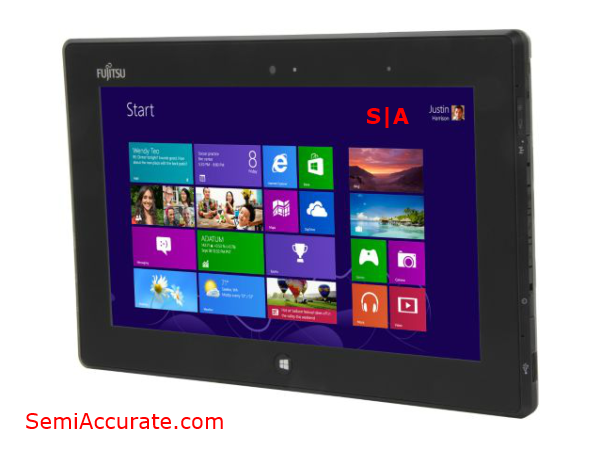 There have been no reviews of Visio’s tablet offering and its product page still displays a, “Spring 2013” ETA. 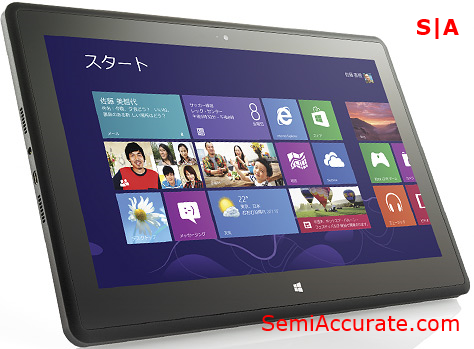 In Japan there is a tablet on sale that looks strikingly similar to Vizio’s design called the LuvPad WN1100. It offers five and a half hours of battery life, has the exact same hardware specifications has Vizio’s unreleased offering, and costs about $600. The only major flaw to this offering is the price point, which should be $100 to $200 lower to be competitive with Intel’s current crop of Clovertrail tablets considering its weaker battery life. Let’s look at another example, Fujitsu’s Q572. 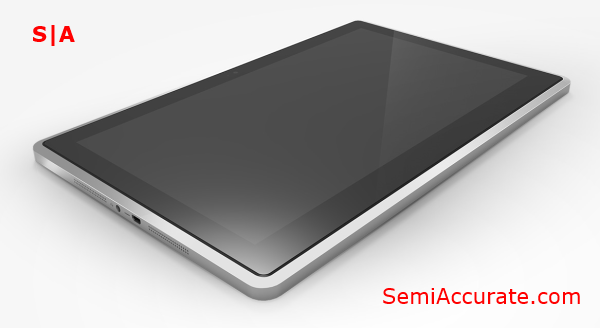 This was a business oriented design that was AMD’s only major tablet design win in 2012. It had a 720p IPS panel, was a bit on the bulky side, and offered a ton of features aimed at business users. It wasn’t a bad tablet per say, but it wasn’t really anything special either. Right now it’s listed on Newegg for a mere $780, and has only one review from a verified owner complaining about dead pixels on the screen. Unlike Vizio’s offering, the Q572 did actually did get reviewed, but only by a single website. NotebookCheck found it to be a disappointing offering that was outperformed by Intel’s Z2760 “Clovertrail” SoC in CPU benchmarks and beat that same chip in GPU benchmarks by only 25% to 30% despite consuming significantly more power. This is only a single data point, but it doesn’t bode well for AMD’s Z-60 chip and that might explain why large OEMs showed so little interest in the chip. The outlook for AMD’s current tablet offerings, as few and as rare as they may be, is grim. The only light at the end of this tunnel is AMD’s upcoming Temash SoC which will hopefully get AMD’s power consumption numbers under control and boost their GPU performance up to a reasonable level. But of course Intel isn’t standing still. Since the launch of AMD’s Brazos chip back in late 2010, Intel has completely refreshed its roadmap and put together a very aggressive plan to make Atom into both a viable tablet and phone processor. AMD’s first real attempt to break into the tablet market with the Z-60 has netted very limited results. And the window of opportunity for AMD to secure a strong position in the Windows 8 tablet market is shrinking quickly thanks to increased competition from Intel, and ARM vendors like Qualcomm and Nvidia. AMD needs to get Temash out into the wild as soon as possible if it’s planning on getting into the tablet market at all.